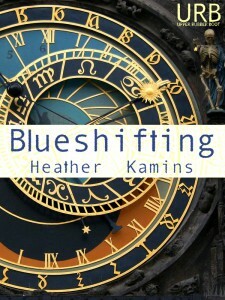 As part of Couplets: a multi-author poetry blog tour, Miriam Sagan interviewed me and posted one of my poems from Blueshifting at her blog. Please check it out! Check out the other posts this month from Couplets: a multi-author poetry blog tour! My guest today for Couplets: a multi-author poetry blog tour is John Amen, who offers some insights into his work. You’ve released three books of poetry. How do you see your work as having evolved over the course of writing those books and into your current work? I hope that I’ve become more adept at exploring a wider range of themes, drawing from a broader and deeper set of content or references. I hope that my craft is evolving, too, that I’m continuing to expand and become more versatile stylistically. In terms of living my own life, I do feel that my experience is more multifaceted than it was even 3 or 4 years ago; it’s my hope that this more varied experience in turn impacts or in some way informs my poems. In many ways, I’ve always been trying to give voice to the paradoxes of life. Ultimately, paradox and the integration of opposites are alchemical principles, but I think they’re very relevant to the artistic or aesthetic process, too. What role does time play in your poetry, both as subject matter and as a part of your process of orienting yourself chronologically? What I perhaps appreciate most about art is that it can present the ephemeral things of life (blooms, thunder, tragedy, success) while also pointing to a more constant and unchanging reality, something more fundamental. In that sense, art is both sensual (i.e., evocative) and metaphysical (i.e., pointing towards an endless continuum of which everything is part and from which everything emerges). The Greeks talked of “chronological” time and “kyrological” time; i.e., time as it is measured by a clock and time as it occurs experientially. In this latter sense, a lifetime can be a moment or a moment a lifetime. It’s said in some mystical sources that God experiences everything (past, present, and future, from the beginning to the end) as one singular and indivisible moment. In addition to being a writer yourself, you also edit The Pedestal Magazine. How does the role of editor influence your writing life, and vice versa? There’s something gratifying about having your thumb on the current literary pulse. I think that’s a perk of editing a journal. You also meet a great number of writers, either personally or through correspondence, and get to immerse yourself in various literary developments and evolutions. These are things I certainly enjoy. There is, however, also the matter of having to juggle matters related to the journal and matters related to your own life and writing. This is to say, editing a journal can be quite time-consuming. Sometimes I feel that my commitment to my own writing (or other interests) gets compromised from time to time. But I think it all works out. I do enjoy sustaining a venue for other writers and being immersed in contemporary literary concerns. All said and done, I don’t think that editing has taken away from my own writing that much. In fact, maybe it has fueled it in some ways. When I look at the big picture, things seem to be pretty balanced, for the most part. 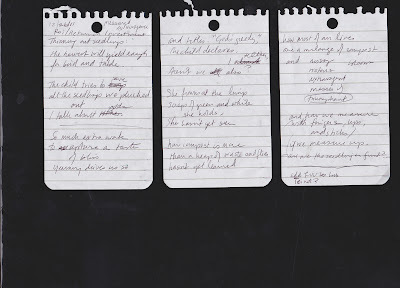 Today’s post for Couplets: a multi-author poetry blog tour offers a look inside the process of Peg Duthie, whose chapbook Measured Extravagance was recently released from Upper Rubber Boot Books. The decision to sketch out the poem in 5-7-5 stanzas was initially just to get the gears in my brain cranking — working within a form, at least to start, has a way of nudging my thoughts out of their usual ruts when it comes to word choices. In this particular case, it was also dictated by the fact that I’d brought only a pocket-sized memo pad with me. every plant we’re tugging out. green and white scraps on her palm. than a heap of waste and flies. As part of Couplets: a multi-author poetry blog tour, here’s a poem of mine and an interview I did over on Steve Vernon’s blog. I asked Steve a few questions, too. I write every morning. Sometimes a little, sometimes a lot. For me, the important thing is regularity. My muse smells a little like bran and prune dip. I want to see a project move forward. Currently, I am working on a young adult novel. I’ve also got several Canadian history projects underway. I still write poetry—but less frequently than I used to. The last half dozen poems were written at the request of several editors who were each putting together a themed collection. I seem to work best, with poetry, if I have a target to aim at. I am most proud of my now out-of-print poem “Barren—A Chronicle in Futility”—a five page poem detailing the events of an 1812 Expedition to hunt the Jersey Devil. The events are lifted from history, although the details are a little more free-style. The poem placed first in the 2009 Chi-Zine Rannu Competition. The prize was $500.00—which to this date remains the most that I have ever earned from a single poem. If all of my poems were that profitable I’d likely write a lot more poetry. What role does horror play in your poems that include it? I write poetry mostly because it pleasures me. I write horror poetry—primarily because it is what I am asked for. I have worked a fair bit in the horror genre and occasionally I am contacted by editors who are looking for a poem written to a specific theme. Other than that—horror is just another possible subject for my poetry. I have also written poems that are love stories, poems about railroads, poems about darn near anything you care to imagine. In fact, the only thing that I have not written poetry about is politicians. Politics and poetry just do not mix. What writers or other influences inspire you? In poetry I’d have to say I’m inspired by the works of Al Purdy, Irving Layton, Charles Bukowski and Milton Acorn. That wore away my days. Here’s another post for Couplets: a multi-author poetry blog tour from Lynn Domina, the author of two collections of poetry, Corporal Works and Framed in Silence, and the editor of a collection of essays, Poets on the Psalms. She lives in the western Catskill region of New York. After a reading I recently did at the Downtown Writers Center in Syracuse, a member of the audience asked about my frequent references to animals, from the most common (blue jays, crows) to the most bizarre (shovelnose guitarfish, spotted wobbegong). It would seem I must spend a lot of time out in nature. The truth is I spend a lot of time with books, especially those hefty expensive full-color books about animals. The books teach me to attend to this world. They teach me to feel astonished at life in its variety. However we all got here, this abundance speaks to me of a God who thrives on infinite possibility. Who could have imagined a tiger into being?—and then changed the stripes to spots so that we could have leopards too?—and then smoothed the pattern away, adding a shaggy mane? What could be more exciting than to witness the creatures of your imagination assume life? And so, because I cannot be a god, I have become a poet. We poets know that our impulse to create most closely aligns us with the divine and with everything that has ever been created. My problem is I want to take it all with me. When I get to heaven, I’ll be saying to God, “oh, by the way, I brought along an armadillo and a rabbit. And a giraffe. And just a couple of tadpoles.” Here is a poem, from my most recent book, Framed in Silence, that grew from this desire. until one did cry off to the north, unmistakable as people said. left by the plump male who springs from your porch swing now. To celebrate National Poetry Month this April, I’ll be participating in Couplets: a multi-author poetry blog tour. Here’s the first in a series of guest posts appearing on the site this month, this one from poet and translator Sue Burke. The Spanish language doesn’t have a verb equivalent to “finesse.” You can express the idea, of course. “She finessed her way into the party,” can be said in Spanish: Se las ingenió para entrar en la fiesta. “She used her ingenuity on things to get into the party.” Not quite the same, but close. When you’re translating, that’s one kind of problem you can encounter, but there are more, as I’ve discovered living cross-culturally. I was born and raised in Wisconsin, and I moved to Madrid, Spain, in December 1999. I’d been studying Spanish since I was 12 years old, and I now hold a certificate from the Instutito Cervantes for mastery-level skill at the language. I also write poetry, especially haiku, so naturally I try to write the same poem in both languages. To succeed, I may have to use certain translation procedures to overcome problems. In Spanish, you nod by asentir con la cabeza or “to agree with the head.” A literal translation would not work. The closest word, mecer, means “to rock,” as in “the hand that rocks the cradle.” So I wrote a Spanish version that means, literally, “the bees / rocking the flowers / of lavender.” It supplies the same physical picture, but the implied meaning is different. You can also paraphrase, which may or may not get you what you need. In Spain, the famous festival in July in Pamplona, known for its running of the bulls, honors St. Fermin, so the fiesta and by extension the run are known as los sanfermines. But as you can see, the paraphrased English version still needs a little work. Another problem is cultural, which can be solved with adaptations. In Europe, the blackbird is the Turdus merula, basically an all-black version of the American robin, Turdus migratorius. (The European robin is a flycatcher, Erithacus rubecula. New World blackbirds don’t exist in Europe. Yes, it’s confusing.) For both these Turdus birds, their song is a harbinger of spring, so if I’m writing for an American audience, I will adapt the name of the bird to avoid confusion. But the following haiku has another problem that requires a compensation. In Spanish, the adverb ya emphasizes the time of the event. What time? Now, then, soon, already, immediately, finally, never … you know from the context. So the Spanish version, translated over-literally, is “the blackbird sings / storks direction to the north / ~time? how that ~time? A particular problem is wordplay and puns. In this example, Spanish words can often distinguish gender, although English words can’t. The translation is exact, but the humor doesn’t come through. Of course, poems can also employ rhyme, rhythm, assonance, figures of speech, and all the other resources that form the art of language and which tend to resist translation. That’s why Italians say tradutore, traditore, “translator, traitor”: translations often betray the meaning, no matter how hard the translator works. Yet these challenges are what makes translating poetry as much fun as writing it.